Department of Pharmaceutics, Dr. D. Y. Patil Institute of Pharmaceutical Sciences and Research, Pimpri, Pune - 411018, Maharashtra, India. ABSTRACT: A RP-HPLC method was developed for estimation of rosuvastatin calcium and validated as per ICH guidelines. The estimation was carried out on C-18 Reliant (4.6 × 250 mm, 5 µm) column using a filtered and degassed mixture of acetonitrile: phosphate buffer pH 2.6 (in the ratio 70:30) as the mobile phase at a flow rate of 1.0 ml/min. The detection was carried out at wavelength of 241 nm. The method was validated for linearity, specificity, accuracy, precision, sensitivity and robustness as per ICH norms. The retention time for the drug was 3.35 min. The method produced linear responses in the concentration range of 2-20 μg/ml with correlation coefficient (r2) of 0.998. The method developed was found to be simple, rapid, precise accurate and reproducible and can be used for routine analysis of rosuvastatin calcium. Diffusion procedure was performed using pig ear skin as diffusion barrier to characterize rosuvastatin calcium release rate from drug -in -adhesive patch and further analyzed by developed RP–HPLC method. The validated method was found to be specific for estimation of rosuvastatin calcium from its transdermal dosage form. The short run time and the possibility of analysis of a large number of samples makes it a suitable method for analysis and quality control of pharmaceutical preparations containing rosuvastatin calcium. INTRODUCTION: Rosuvastatin calcium is one of the most potent statins and is approved for reducing circulating low-density lipoprotein cholesterol (LDL-C) levels 1-3. Rosuvastatin calcium is a synthetic 3-hydroxy-3-methylglutaryl coenzyme A (HMG-CoA) reductase inhibitor. The oral bioavailability of rosuvastatin calcium is approximately 20%. The immediate release formulations have increased risk of adverse effects, like dose-related musculoskeletal and hepatic toxicities. Transdermal drug delivery system is advantageous over other routes of administration in evading the "first-pass metabolism" by the liver, exempt from the impacts of the gastrointestinal fluid and provides controlled and sustained effects. Drug- in- adhesive patch using acrylate emulsion polymer novacryl, permeation enhancers like polyethylene glycol 400 and transcutol was formulated for delivery of rosuvastatin calcium. Literature survey revealed that rosuvastatin calcium has been determined by spectrophotometric methods 4-5, complexometric titration method 6, LC-MS 7, Stability indicating methods 8-11, RP-HPLC 12-15 etc. Present study involves development and validation of a simple RP-HPLC method for the determination of rosuvastatin calcium from its transdermal dosage form. Chemicals and Reagents: Rosuvastatin calcium standard (purity ≥ 99.0%) from Cipla Ltd., Mumbai, acrylate emulsion polymer novacryl was obtained from Omnova Solution Inc and transcutol was obtained from Gattefosse SAS as gift sample. Acetonitrile (HPLC grade), Methanol (HPLC grade) was purchased from Molychem (India) and membrane filter (0.45 μm) was purchased from Millipore (India). Chromatographic Conditions: Chromatographic separation was achieved by using Agilent 1200 series quaternary pump system with chemstation version.02.03 with C-18 Reliant (250 × 4.6 mm, 5 µm) column and 20 µL loop for injection. The mobile phase used in this analysis was acetonitrile and phosphate buffer pH 2.6 in the ratio of 70:30. The mobile phase was filtered, degassed and filtered through 0.45 μm membrane filter before use. The flow rate was adjusted to 1.0 ml/min; the detector wavelength was set at 241 nm. The injector volume of standard and sample was 20 µl. The solution was injected and chromatograms were recorded. Calibration curve was constructed and regression equation was calculated for rosuvastatin calcium. Preparation of Standard Stock Solution: 10 mg of rosuvastatin calcium was accurately weighed and transferred to a 10 ml volumetric flask. Methanol was added to dissolve the drug and volume made upto 10 ml with methanol. Standard stock solution was further diluted with mobile phase to obtain a 50 ppm solution. Method Validation: 16 The developed analytical method was validated for linearity, accuracy, precision, specificity, LOD and LOQ. All validation experiments were designed according to the principles out lined in the ICH Q2 guidelines. System Suitability: System suitability is used to verify, whether the resolution and reproducibility of the chromatographic system are adequate for analysis to be done. The parameters like retention time, area, symmetry, number of theoretical plates & mass distribution ratio (capacity factor K’) were investigated by injecting standard solutions. Linearity: A series of solutions were prepared from the primary standard stock solution in the concentration range of 2 to 20 μg/ml. Calibration curve was plotted as concentration on X axis and peak area on Y axis and linear regression equation was calculated. Method Precision: Precision studies were performed (Method, Day to day). The results are reported in term of Relative standard deviation. For intra-day precision, the standard solution was analyzed for six times within a day, while for reproducibility studies, it was examined in triplicate for three consecutive days. Accuracy: The accuracy of the method was established using recovery technique i.e. external standard addition method. The known amount of standard was added at three different levels to pre analyzed sample. Each determination was performed in triplicate. Robustness: Robustness of the method was determined by making slight changes in the chromatographic conditions. The robustness was performed for the flow rate variations from 1 ml/min to 1.2 ml/min, mobile phase ratio variation from more organic to less organic phase and wavelength from 241 to 239. It was observed that there were no marked changes in the chromatograms, which demonstrated that the RP-HPLC method developed is robust. (Where σ = the standard deviation of the response and S = Slope of calibration curve). Specificity: Specificity is the ability of the method to measure the analyte in the presence of other relevant components that are expected to be present in the sample. Placebo patch was used for the study. Placebo patch was placed in 20 ml of phosphate buffer pH 7.2, sonicated for 20 min, solution was decanted and filtered through 0.45 μm membrane filter. 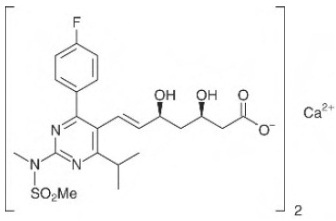 The solution was injected under optimized chromatographic conditions to demonstrate separation of rosuvastatin from excepients. There is no interference of placebo peak with the peak obtained for rosuvastatin indicating the high specificity of the method. Ex-vivo Diffusion Study: The diffusion studies of rosuvastatin calcium loaded transdermal patch (novacryl-PEG 400 and novacryl - transcutol) was carried out. The studies were performed using modified Frank diffusion cell apparatus with receiver compartment capacity of 20 ml using pig ear skin as diffusion barrier. The medium used for diffusion was phosphate buffer pH 7.2. The medium was degassed via sonication process, and temperature was set at 32°C during the experiment. At appropriate time, 1 ml of the sample was withdrawn from the receiver compartment and the same amount of fresh buffer was added to keep the volume constant. Release was recorded for 8 h.
System Suitability Test: The capacity factor (K’) was 1.24. The plate count was more than 5000 and the symmetry factor was 0.93. The results are summarized in Table 1. Precision: Relative standard deviations obtained for Rosuvastatin calcium was 0.883 %. The results are tabulated in Table 3. The measurement of the peak areas are expressed in terms of % RSD and were found to be < 2%. The results are shown in Table 4. Robustness: It was observed that there were no marked changes in the chromatograms, which demonstrated that the RP-HPLC method developed was robust. The results are shown in Table 6. There was no interference of peak obtained for placebo patch with the peak obtained for rosuvastatin calcium indicating the high specificity of the method. DISCUSSION: By applying the proposed method, the retention time of rosuvastatin calcium was found to be 3.35 min. Linearity was observed in concentration range of 2-20μg/ml. The regression equation of concentration over peak area was found to be y = 54.64x + 74.25 (r = 0.998) where y is the peak area and x is the concentration of rosuvastatin calcium (μg/ml). The symmetry obtained was 0.92 which indicates good shape of peak. The percentage of recovery in the range of 99.52-100.7% indicates that the proposed method is accurate. The % RSD value < 2% for both method and inter- day precision indicates the precision of the method. The use of acetonitrile and phosphate buffer pH 2.6 in the ratio of 70: 30% v/v resulted in peak with good shape and resolution. The above validated method when applied for analysis of ex-vivo diffusion study samples did not show any peaks interfering within the run time for rosuvastatin calcium, indicating that excepients used in the patch did not interfere with the estimation of the drug by proposed HPLC method. CONCLUSION: The proposed method has the advantage of simplicity and convenience for the separation and determination of rosuvastatin Calcium in bulk and from its dosage form due to low retention time of analyte. Thus the method is accurate, precise, and selective for estimation of rosuvastatin calcium from its dosage form. ACKNOWLEDGEMENT: We appreciate the generosity of Cipla Ltd., Mumbai, Nippon Synthetic Chemical Industry Ltd., Omnova Solution Inc, Franklin Adhesives and Polymers and Gattefosse SAS for providing us with gift samples of drug and polymers required for carrying out our research work. Luvai A, Mbagaya W, Hall AS and Barth JH: Rosuvastatin: A review of the pharmacology and clinical effectiveness in cardiovascular disease. Clin Med Insights Cardiol. 2012; 6: 17-33. Hu M and Tomlinson B: Current Perspectives on rosuvastatin. Integrated Blood Pressure Control 2013; 6: 15-25. Abdullah K and Rohatgi A: Statins: Practical Considerations - A Review. European Cardiology Review 2014; 9(2):71-5. Narayankar SM, Sakpal PH and Bhingare CL: Quantitative Determination of Rosuvastatin Calcium and Niacin Individually and Combined Tablet Dosage Form by using UV-VIS Spectrophotometer. International Journal of Pharma Research & Review 2015; 4(6): 37-43. Ramadan AA, Mandil H and Alshelhawi N: Spectrophotometric Determination of Rosuvastatin Calcium in Pure Form and Pharmaceutical Formulations by the Oxidation Using Iodine and Formation Triiodide Complex in Acetonitrile. International Journal of Pharmacy and Pharmaceutical Sciences 2014; 6 (5): 579-585. Baldut M, Bonafede S, Petrone L, Simionato L and Segall A: Development and Validation of a Complexometric Titration Method for the Determination of Rosuvastatin Calcium in Raw Material. Advances in Research 2015; 5(5): 1-8. Kumar PP, Murthy TE and Basaveswara Rao MV: Development, validation of liquid chromatography-tandem mass spectrometry method for simultaneous determination of rosuvastatin and Metformin in human plasma and its application to a pharmacokinetic study. J Adv Pharm Technol Res 2015; 6(3): 118–124. Suares D and Prabhakar B: Stability-Indicating Assay Method for Determination of Rosuvastatin in Nano-Formulation and Pharmaceutical Dosage form By RP-HPLC .International Journal of Pharm Tech Research 2016;9(7): 265-274. Trivedi HK and Patel MC: Development and validation of a stability indicating RP-UPLC method for determination of rosuvastatin and related substances in pharmaceutical dosage form. Sci. Pharm 2012; 80(2): 393-406. Turabi ZM and Khatatbeh OA: Stability-Indicating RP-HPLC Method Development and Validation for the Determination of Rosuvastatin (Calcium) In Pharma-ceutical Dosage Form. Int. J. Pharm. Sci. Drug Res 2014; 6(2):154-9. Khivasara A, Kawale L A, Shirode L , Badhe N, Ahire P and Lale S: Development and Validation of Stability Indicating RP-HPLC Method for Simultaneous Estimation of Rosuvastatin Calcium and Aspirin in Bulk and Pharmaceutical Dosage Form. Indo American Journal of Pharmaceutical Research 2016; 6(02):4417-26. Attimarad M, Alkadham A, Almosawi MH and Venugopala KN: Development of Rapid and Validated RP-HPLC Method for Concurrent Quantification of Rosuvastatin and Aspirin form Solid Dosage Form. Indian Journal of Pharmaceutical Education and Research 2018; 52(1): 151-8. Kumar HT, Sri SD, Rao VPK and Rao SY: Validated RP-HPLC Method for Determination of Rosuvastatin Calcium in Bulk and Pharmaceutical Formulation. Int J Pharm Sci Res 2015; 6(7): 2913-17. Sagar GV, Parameswari AS, Madhusudhana C, Chetty M, and Kumar AVS: Development and validation of RP-HPLC method for simultaneous determination of Rosuvastatin calcium and Clopidogrel in capsule dosage form. Journal of Pharmacy Research 2012; 5(9): 4881-4883. Murthy TGK and Geethanjali J: Development of a Validated RP-HPLC Method for Simultaneous Estimation of Metformin Hydrochloride and Rosuvastatin Calcium in Bulk and In-House Formulation, J Chromatogr Sep Tech 2014; 5: 6. ICH, Q2 (A), Validation of analytical procedures: Text and methodology International Conference on Harmonization, Geneva. 2005; 1- 13. Geevarghese RB and Shirolkar SV: RP-HPLC method for estimation of rosuvastatin calcium from bulk and transdermal dosage form. Int J Pharm Sci & Res 2018; 9(11): 4875-79. doi: 10.13040/IJPSR.0975-8232.9(11).4875-79. Authors Address: Department of Pharmaceutics, Dr. D. Y. Patil Institute of Pharmaceutical Sciences and Research, Pimpri, Pune, Maharashtra, India.